Platform Insert for Sea Ray - 26ft & Under - PlasTEAK Inc. NOTE: This price is for ONE insert. Please order two to receive a pair. 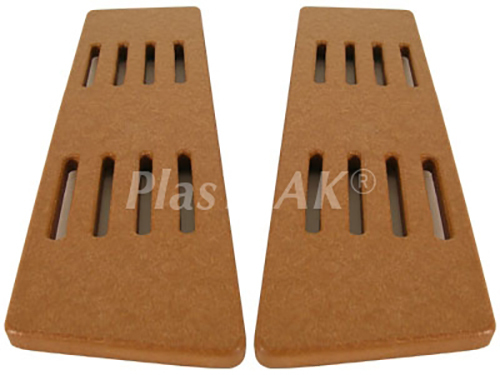 Replacement inserts for teak Sea Ray swim platforms – for boats under 26′ (7.9m). Replace your rotten teak inserts with these durable recycled plastic inserts that are guaranteed to look great for years. Your inserts will always look like freshly oiled teak and they won’t fade, crack, or rot. These inserts measure approx. 21 1/2″ (54.61cm) x 5 7/8″ (14.93cm) x 1 1/8″ (2.86cm). Some 26ft and under Sea Ray boats have inserts with straight sides, and not the angled sides seen here in our photos. No problem! We can make those too! This size Sea Ray insert doesn’t come with replacement step pads. However, custom made steps are available upon request with additional cost. Contact us for more information.